A full report on that event appeared in Bus & Coach Buyer issue 1340, 14 August 2015. Built at the Annonay plant in France, rather than the Vysoke Myto plant in the Czech Republic where the Crossway range hails from, the original version of the Magelys was first shown to the public in 2007. An integral design, it combines tubular and pressed steel sections within a body shell that is corrosion protected through emersion in a cataphoretic dip tank process. Always an attractively styled coach, the Euro6 version, which has won the award, has been aesthetically enhanced by the addition of what Iveco refers to as ‘The Silver Smile’, a brightwork feature on the lower panel beneath the front screen carrying the Iveco name. This is now carried by all of Iveco’s integral bus and coach range. Also new are the light units and the rear lights which are also common across the range, one of a number of ways in which the manufacturer has sought to simplify things for operators and reduce the total cost of ownership (or TCO). Offered in both 12.2m and 12.8m variants, the coach entered in the Coach Euro Test was the longer model that can accommodate a maximum of 59 passengers if specified without toilet, though that demonstrated seated only 46 on Kiel recliners in an execution developed specifically for express line work. Alone among the participants, this featured three point belts throughout and a nice touch was that ‘Welcome Aboard’ was stitched into every seat squab. For the express line role, it was equipped with a nearside door providing access for wheelchairs boarding by means of a Dhollandia lift stowed across the width of the luggage hold. 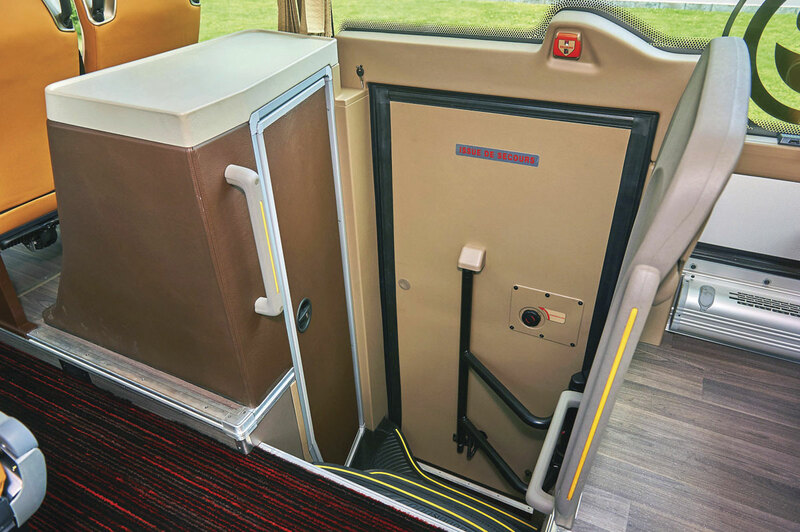 In contrast with the usual UK method of ensuring drivers do not have to demount seats, the Iveco solution was to fit facing seats alongside the doorway with an easily stowed table between. 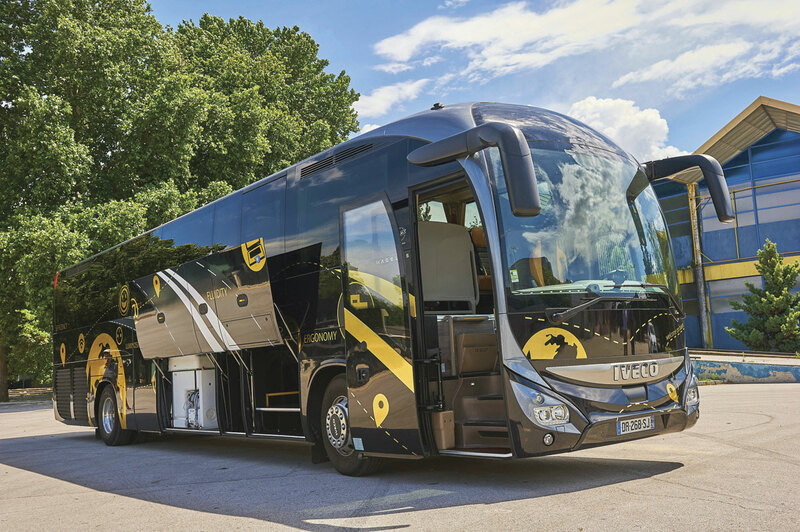 Express coaches are of particular interest in France at the moment because of the introduction of the ‘Macron Law’ heralding the liberalisation of express route operation to a degree. 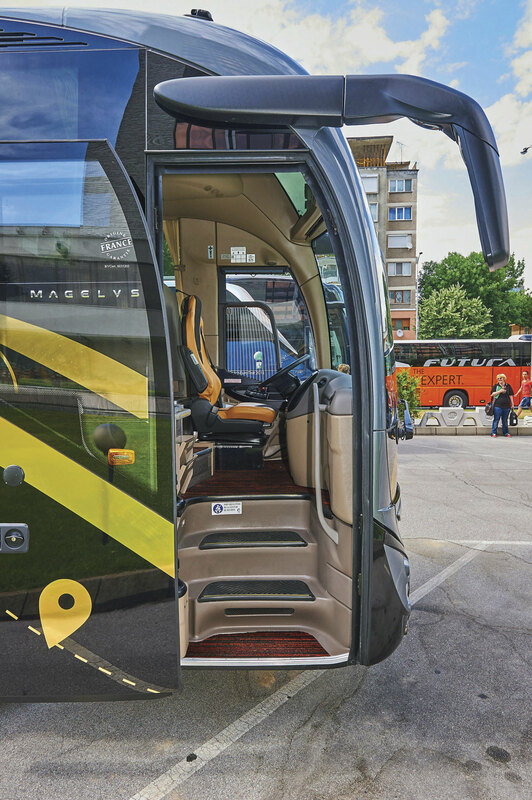 Internally the Magelys takes a very different approach to other coach designs in a number of ways. Firstly, you won’t find any grey in the trims used, there isn’t any. Instead everything is in shades of brown, including all of the plastic mouldings. 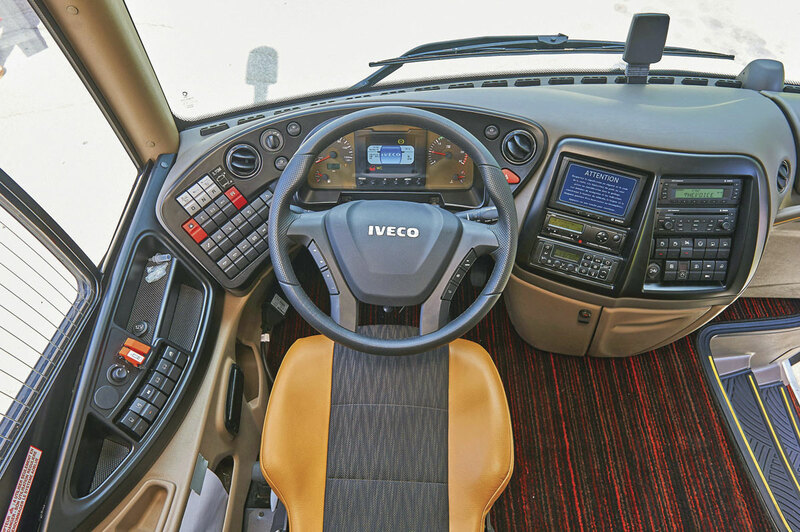 However, the most distinctive feature is that rather than the conventional method of mounting the racks close to the windows, Iveco has set them inboard a way, leaving sufficient room for the passenger next to the window to stand fully upright. 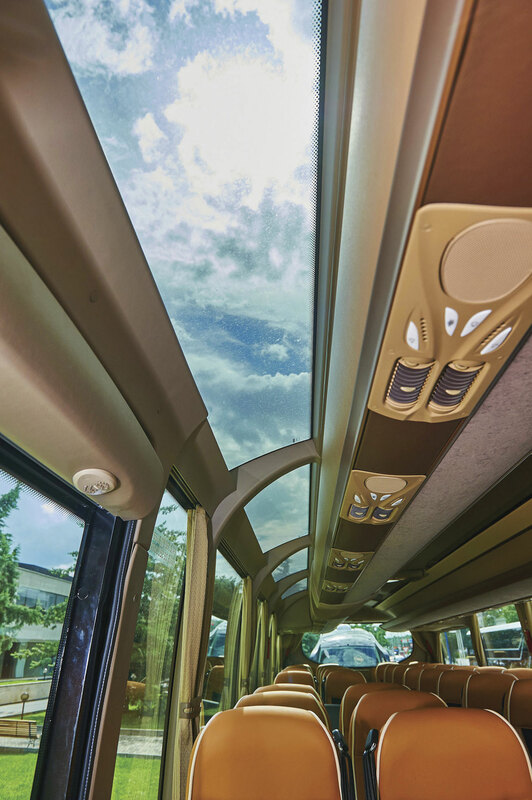 On top of this, the greater part of the length of the roof edge on each side of the coach is glazed which, together with the deep side windows, means that there is 35% more light entering the coach than there otherwise would be. You can have the whole ceiling glazed if you want but it requires specialist cleaning facilities and a degree of additional nuisance which is one reason why very few operators specify it. 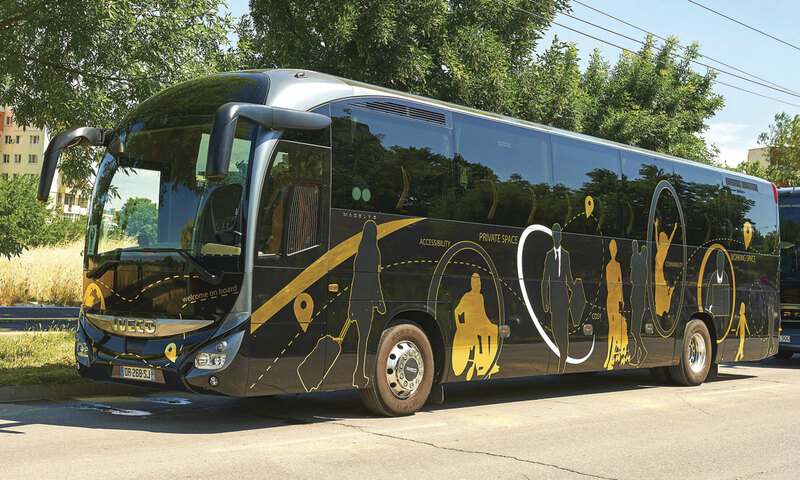 In an effort to enhance passenger comfort, a number of passenger entertainment systems are incorporated including GPS, a road camera, Wi-Fi and a system that provides a choice of 250 movies, as well as the USB and 220 volt plugs necessary to keep today’s communication devices charged and working. For the driver, the cockpit is quite well laid out with the steering wheel given the leather look treatment. Most jurors found it very comfortable to drive, though not as swift to accelerate as some. 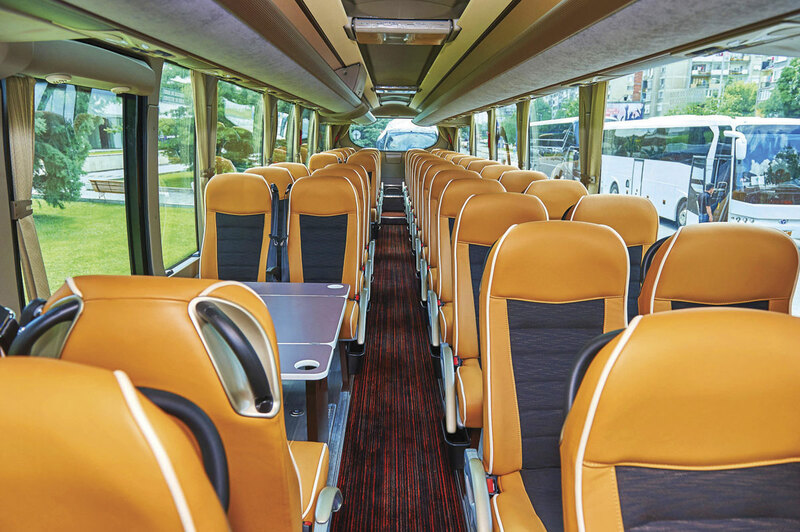 We’ve heard a lot about how bus engines are being downsized to make them more fuel efficient and though the race to have ever more horsepower does seem to have ended for coaches, we haven’t seen much evidence of a similar downsizing trend in coaches. Suggesting there may be some scope for it, the Magelys is only offered with the FPT Cursor 9 unit that has a capacity of only 8.7 litres, yet delivers 294kW (400hp) and torque of 1,700Nm at 1,250rpm. This weighs less than the Euro5 version and is matched to the ZF AS-Tronic automated transmission. 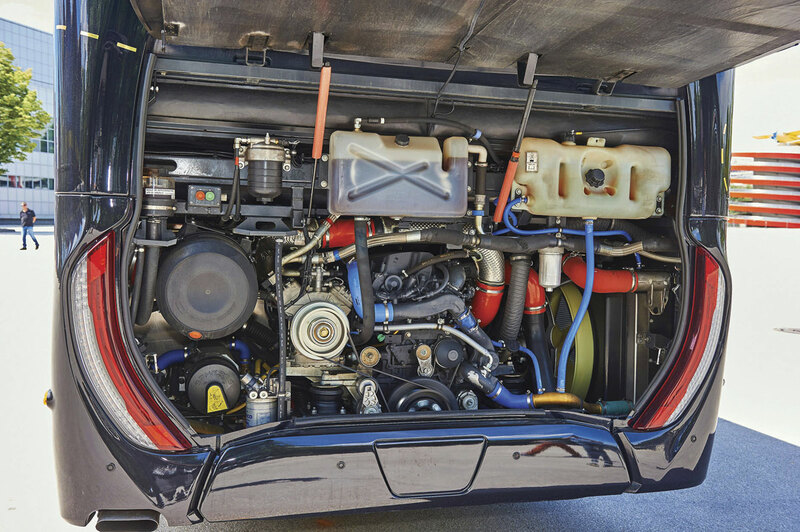 The really noteworthy aspect of it is that it eschews EGR (exhaust gas recirculation) to control the engine exhaust emissions, relying solely on SCR (selective catalytic reduction) to accomplish this. Iveco claim that the move to Euro 6 has seen a fuel usage reduction of up to 10%. In addition to the physical features of the Magelys, something that most jury members commented upon was the value for money that the vehicle represented, with the price surprisingly low given the quality of what was provided. If this has whetted your appetite for the Magelys, I’m sorry, but there are no plans to begin offering it (or any other full sized Iveco products) in right hand drive form. The Coach Euro Test event at which the winner was determined was organised in Plovdiv, Bulgaria’s second city, by Lachezar Apostolov, the Chief Editor of the Bulgarian magazines Kamioni and AvtoBusi and sponsored by ZF, Busworld, EuroPart, the city of Plovdiv and the Park Hotel Sant Petersburg with support from local operator, Hebr os Bus. 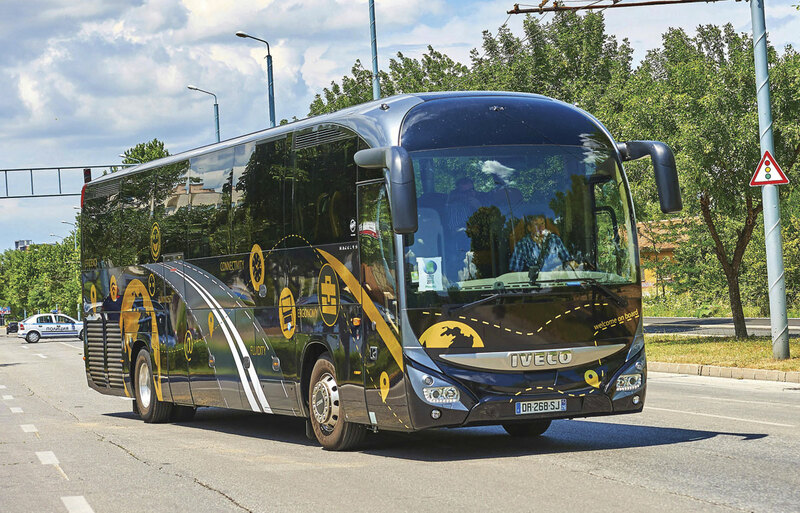 Iveco’s triumph marks the first time the company has won the International Coach of the Year award since 1995 when the EuroClass HD was the winner. Coincidentally, it was the year Bus & Coach Buyer was elected to the Jury and the first time I participated in the voting process. In those days there was no Coach Euro Test before the voting was undertaken. 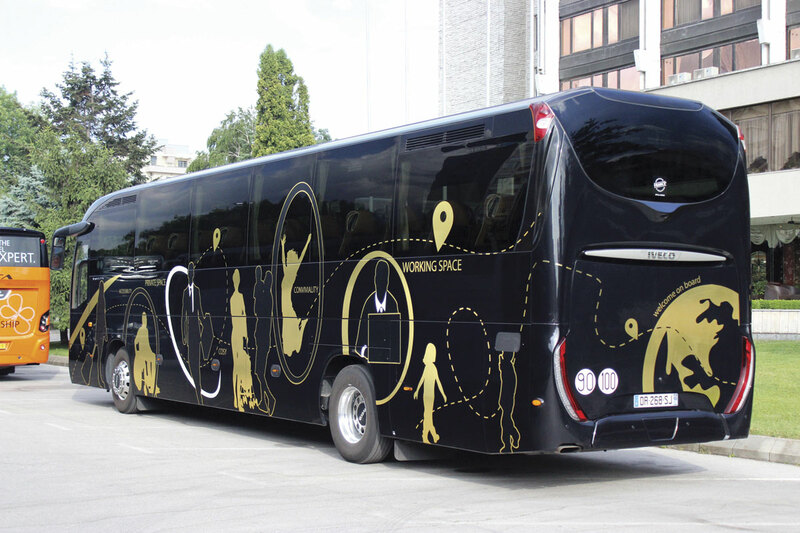 The award will be presented during the press days at Busworld Kortrijk exhibition which will be open to the public from 16-21 October.